We then like to follow up with a real life example of a young boy who used his passion to inspire others and (inadvertently) create a worldwide movement. This video also provides an excellent of the power of collaboration and social media. 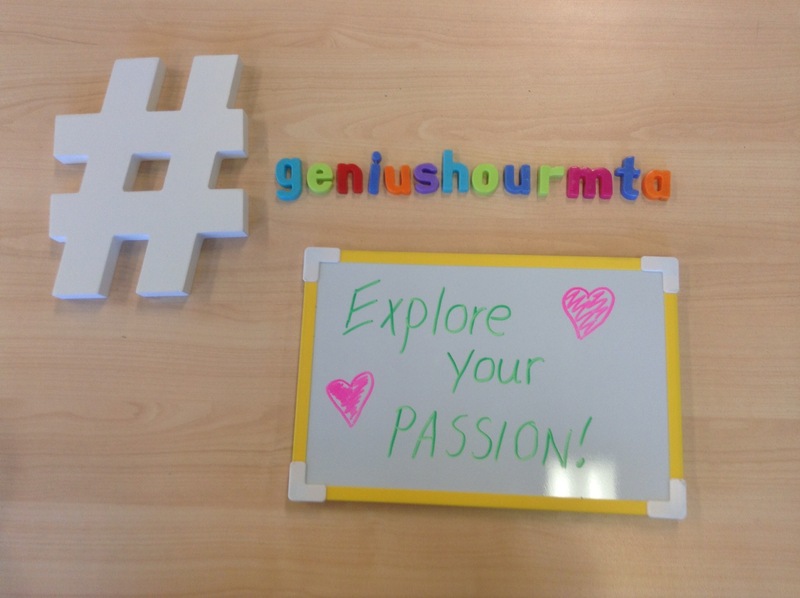 I can’t wait to follow the progress of our Year 8 students in #geniushourmta and look forward to sharing this with you as they begin to explore their passions. Genius Hour has become quite a trend in the educational sphere lately and, after seeing it in action at Merrylands East Public School last term, I decided to try it with my Year 8 class this term. Genius Hour is based on the initiative by Google to give their employees twenty percent of their week to explore something they are passionate about. Google found this incentive incredibly productive and many of their recent projects such as Gmail, originated from the work completed by employees in this time. Although, Google has since cancelled 20% time in the workplace, I really love the idea of working on something you are passionate about. Students often whinge that they don’t like the topic being studied or wish they could be doing something else, and for me this is what Genius Hour is about – working on something you are passionate about. Genius Hour in the classroom gives the students a lesson a week to work on something they are passionate about and discover their ‘genius’. This program at Mount Alvernia is based around our Inquiry-Based learning approach and allows students to create a passion-based project as they move through the stages of inquiry. There have been many studies undertaken around Genius Hour in education and I encourage you to explore these online by typing ‘Genius Hour’ into a Google search. Dan Pink in particular, is a key motivator in this area and his TED talk explains the ideas behind Genius Hour well. There are many resources and approaches available online provided by particular teachers, and while many of these approaches vary, the key idea I have taken on board is that genius hour, while student-centred, needs a defined structure. I think many people are quick to jump on board because they like the idea of giving students an hour to ‘do whatever they want’, in my perspective, this would never work. While students may like this idea for a few lessons, I could see them quickly become bored and disengaged as they run out of things to do, or, achieve what they want to in one lesson and be left with nothing to do. I approached Genius Hour as an opportunity for students to undertake an inquiry project on something they were passionate about. While the topic and outcomes were completely up to them, what I was looking for was their ability to move through the inquiry process and measure the differences in their knowledge and understandings before they started and after they finished. While this approach is quite student-centred, it does involve the teacher (or a team of teachers) to act as mentors and guide the process. Much like guided-inquiry, there is always opportunity for teachers to intervene when things aren’t going to plan and ensure that students are on task and achieve what they set out to. Recently, I came across a blog post by Ewan McIntosh suggesting that 20% time (Genius Hour) is not measuring up to expectations when applied to a classroom context. I interpreted his main concern as being that when students are given this time, they don’t know what to do or quickly lose interest when their projects become too difficult for them to manage. I guess this comes back to structure and process, I don’t expect all 30 students to create something that ‘wows’ me, what I do expect is to all students passionate about why they are learning. I think Simone de Beauviour hit the nail on the head when she stated,”One is not born a genius, one becomes a genius”. This is exactly what Genius Hour provides for, allowing students to consider what their passion is and how they might go about using their passion to create something. Personally, I am hoping that Genius Hour will inspire the girls to explore their passions, allow them to take ownership of their learning and further develop skill such as research, collaboration, problem solving and critical thinking. We are only a few weeks into Genius Hour, but I am expecting students to be actively involved and enjoying a project of their choice.. the passion this involves is more the genius I’m looking for. 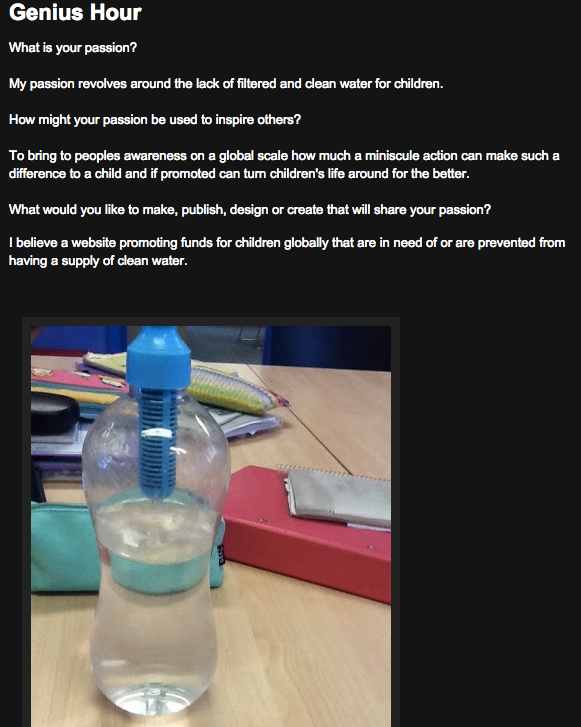 While it is still early days for #geniushourmta I have included some screen shots of some of the plans the students have for Genius Hour (taken from their reflective blogs). I’m looking forward to the final products! Enter Librarians 2.0 – We’re not paid to shush! Is your Library in the World of 2.0?